Novica.com is... a stunning global market. Rugs, Furniture, Handbags, Jewelry, Musical Instruments, Collectibles, Masks, Boxes... it's all there and it's all finely crafted by artisans from almost every nation. You can, quite literally, spend hours browsing the on-line catalog. I was recently blessed with the chance to review an item for Novica.com and I was so happy to accept! 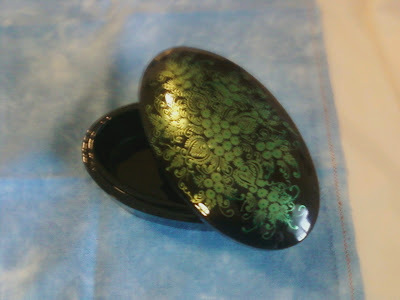 After many hours, I choose the gorgeous Emerald Blossoms Lacquered Box from artist Nantana Sompamitre of Thailand. This box is hand-carved and sculpted from Mango Wood (A hard, dense wood excelelnt for crafting bowls, boxes, and furniture). 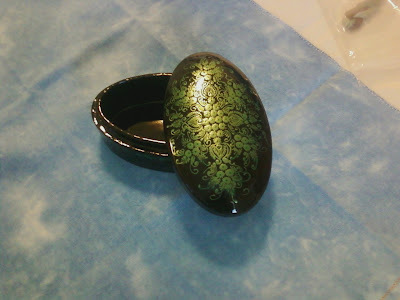 After carving the wood, sculpting the design, and painting it, Nantana polishes the wood then coats the box with layer after layer of lacquer. The shine is so glossy that it looks like glass! The wonderful folks at Novica want to share their marvelous finds with you! So have they've generously offered one of our followers a chance to win a $35 GC to their store! @GeorgiaMist @novica Win a $35 GC from Novica and Gathering My Roses! This contest will be open from Monday, June 6th until Monday, June 20th. Winner will be announced on Tuesday, June 21st. 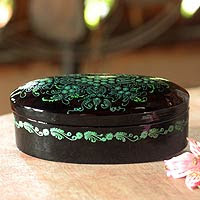 Novica provided me with a complimentary Emerald Blossoms Lacquered Box for the purpose of this review. I was under no obligation to review this item. I received no monetary compensation. The opinions expressed in this review are my own and based on my own personal use of the item. That little box is gorgeous Terri!! Although my husband and I frequently watch the National Geographic channel, I had never heard of Novica until I read your blog. I don't remember when I've seen such stunning items! I would most like to purchase the Lapis lazuli flower necklace, Jungle Blossom bu Busarin - it's just gorgeous! I would love to have the Rose quartz dangle earrings, 'Delhi Romance'. I'd like to have the Pearl Wrap bracelet-Garland. So much great stuff! Would love to get one of the men's leather cuff bracelets for my son, he would love those! I'd like to have the Blue Trinity ring. I would love to have their 'Blue Carribean' hammock! Stunningly beautiful! I love the chrysanthemum mirror. "Wood khim dulcimer, 'Black and White'" is awesome. My family would love it. I love the Teak chest, 'Treasures' from Thailand. Very unique and precious! I like Novica on Facebook as Jo Sue. I like the Sky Goddess bracelet (http://www.novica.com/itemdetail/index.cfm?pid=172691). I like Sterling Silver Brooch Beautiful Rose. I love to have their Beaded wristband bracelets, 'Bold Brown Fortunes. I followed GeorgiaMist on twitter. it is what I would get. Love the silver Revolution bracelet! I'd like to get the Blue Trinity Ring. I like the Wisteria Garland Amethyst Bracelet. I would like to have the Aquamarine ring, 'Imagine' by Silvia Lima. Follow Novica on Facebook (Elena Shkinder-Gugel). Follow Gathering My Roses publicly via GFC (Elena Shkinder-Gugel). Follow Gathering My Roses via Networked Blogs (Elena Shkinder-Gugel). I like Gathering My Roses on Facebook (Elena Shkinder-Gugel). #1 Follow Once Upon a Product Review via GFC (Elena Shkinder-Gugel). #1 Follow @onceuponreview on Twitter (@spelena). #2 Follow @onceuponreview on Twitter (@spelena). #1 I like Once Upon a Review on Facebook (Elena Shkinder-Gugel). #2 I like Once Upon a Review on Facebook (Elena Shkinder-Gugel). Following NOVICA via Twitter (@Hotsnotty2), Thanks! I'd like the carribean pina colada glasses. Thanks for the giveaway...would like to pick up an Amethyst and garnet flower necklace, 'Timeless Water Lily', for my daughter @ NOVICA ! Now following Once Upon A Review GFC.